Mangaluru, June 16, 2016: The explosive atmosphere brewing, forecasts litigation and unrest between the landowners/ farmers around Surathkal region and MRPL, Mangalore Refinery and Petrochemicals Ltd. with the latter seeking another 1,050 acres of land around its existing plant for expansion of its operations. MRPL’s expansion proposal at a cost of Rs. 12,000 crore was approved by the State government during the recent Investors’ Meet. MRPL, operating in Kuthettur and surrounding villages, has three phases producing about 15 million tonnes of different categories of fuel and other products per year, including polypropylene, bitumen and LPG. It set up shop amid vociferous opposition by the local farming community, which ultimately had to yield. The Samithi president states that neither MRPL nor the KIADB, Karnataka Industrial Area Development Board are coming out with the actual extent of land granted to MRPL so far; the extent of land used by the company and vacant land in its possession. When Phase III could be accommodated in just about 50 acres, what is the need for 1,050 acres of land for Phase IV, he asked and said that the samithi has petitioned agencies concerned under RTI for the details. While land owners claimed that more than 80 per cent of them have objected to the acquisition, DC. Ibrahim, quoting KIADB as saying, said that 70 per cent of land owners have consented to the acquisition. MRPL managing director H. Kumar, however, has a different view. With the newly acquired land, MRPL would be contributing to environment conservation, he said. The company has to set up infrastructure, including machinery, to graduate from Bharat IV standard fuel to Bharat VI standard, which the country has to adopt by 2020. The sulphur content in the fuel (petrol and diesel) has to be brought down from 50 mg/kg (Bharat IV) to 10 mg/kg by 2020. The reduction in sulphur content is indirectly benefiting environment conservation. At the same time, the expansion would also result in enhanced production capacity, up to 21 million tonnes per year, since MRPL has to cater to the demand for petrol, which is increasing by 14 per cent per annum, and diesel that is increasing by 8 per cent per annum, in the State. 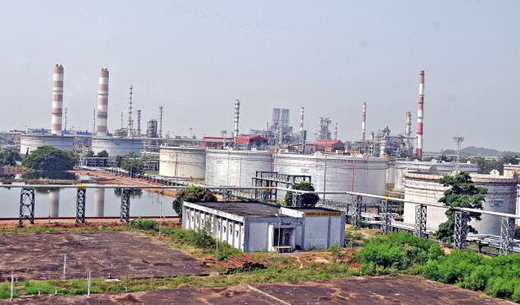 MD Kumar claimed that MRPL does not possess any excess land nor was there enough land available in the Special Economic Zone to house Phase IV. DK district administration has said that the 1,050 acres proposed to be acquired through KIADB for MRPL expansion is spread over 10 villages. The land would be utilised for expansion as well as rehabilitation of displaced persons. According to DK DC Adoor.B. Ibrahim, land would be acquired in Thokur, Baikampady, Tannirbhavi, Kalavara, Bala, Jokatte, Permude, Kuthettur, Delantabettu and two other villages.